Aiming to create a high-performance motorcycle that could defeat the RVF750 in the Suzuka 8 Hours Endurance Road Race, Honda developed an advance research stage model that led directly to the CBR900RR, which debuted in 1992. 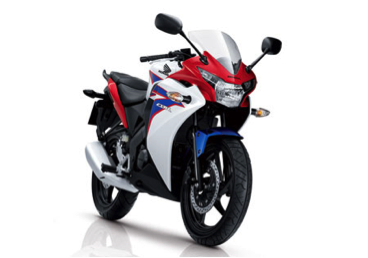 With the objective of equaling the acceleration performance of competitors’ flagship sport bikes, Honda increased the stroke of its inline 4-cylinder 750cc engine and raised displacement to 893cc. Complementing this excellent power performance were the bike’s dry weight of 185 kg, wheelbase of 1,405 mm and body almost identical to that of the advance research stage model. It all added up to completely original super sport bike packaging and a motorcycle so easy to control it seemed to read the rider’s mind. 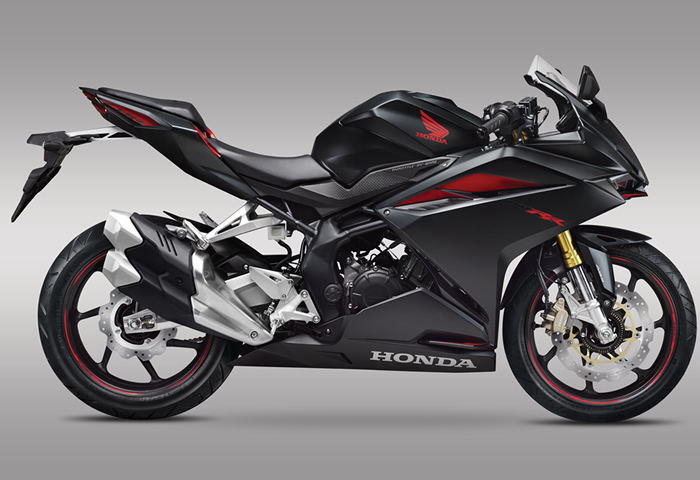 By developing the most lightweight and compact bike in its class, Honda ushered in the era of super sport bikes focused on superior handling and control. 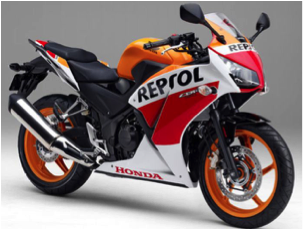 Launched two years after the first-generation machine, the 1994 CBR900RR featured enhanced engine efficiency and a fully adjustable front fork with superior road-holding ability. Thanks to these features, the ultimate handling machine had even more appeal than before. To take the lightweight design of the original model to the next level, every part of the bike was refined, with the upper cowl stay going from steel to aluminum and the cylinder head cover from aluminum to magnesium. 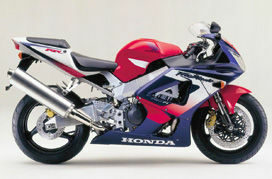 The styling of the bike also changed dramatically. The independent dual lights became irregular-shaped multi-reflector lights known as “tiger eyes,” and the cowl featured surfaces flush with the lines of the bike. The twin spar frame did not vary in appearance from that of the 1992-1995 models, but it became even more lightweight and offered optimized rigidity. Also new were the fuel tank shape and the riding position, resulting in even better handling. The exterior styling featured a new rear cowl with enhanced aerodynamics. In the engine, bore increased by 1 mm for a bore and stroke of 71 mm x 58 mm, increasing displacement from 893cc to 918cc. Enhancing rideability were 4 PS-higher maximum output of 128 PS and a new throttle position sensor in the carburetor. 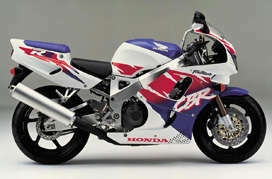 Thanks to the new stainless steel exhaust pipe, new fuel tank shape and the elimination of the fuel pump, the 1996 CBR900RR weighed in at 183 kg—1 kg lighter than the first-generation model. 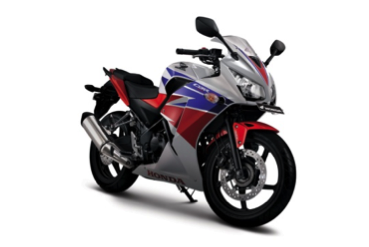 From the beginning, the motorcycles in the CBR series have been designed to be as lightweight as possible. 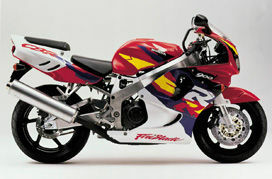 For 1998, 80 percent of the parts in the 1996-1997 CBR900RR were redesigned. The team aimed for lightweight design even at the level of a single bolt, reducing dry weight to 180 kg and further enhancing dynamic performance. A swingarm pivot with enhanced rigidity; a lightweight, highly rigid swingarm with a new tapered shape; a head pipe with revised dimensions; and other new design elements combined to take high-speed stability to an even higher level. Riders also appreciated the extra power that the model had to offer, thanks to new engine settings that raised horsepower by 2 PS to 130 PS. 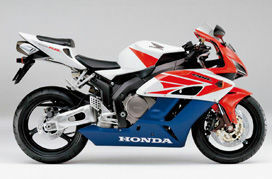 Until the 2000 model year, the engine of the CBR900RR had not changed significantly from that of the advance research stage model, but it would now be completely redesigned. 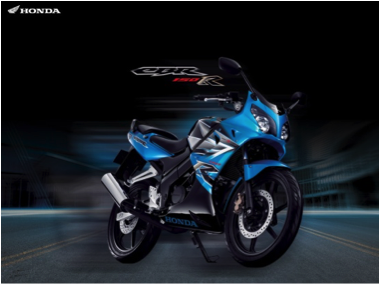 It became the first CBR series engine to adopt a fuel injection system (PGM-FI, Programmed Fuel Injection), displacement increased to 929cc, and maximum output rose significantly, to 148 PS. Both the body and the frame were completely redesigned. An independent U-shaped plate held the swingarm pivots, resulting in a semi-pivotless frame. Without raising rigidity more than was necessary, this mechanism allowed the rear section to be optimally flexible during cornering. 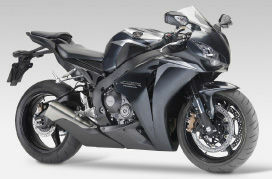 The result was a combination of superior cornering stability and extremely light handling worthy of a super sport bike. 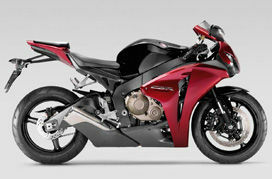 Now more than ever, the CBR900RR had become a super sport bike that any rider could enjoy. Further, in keeping with the lightweight identity of the series, the exhaust pipe and a portion of the muffler were made of titanium, helping to reduce dry weight to 170 kg—15 kg lighter than the first-generation model. 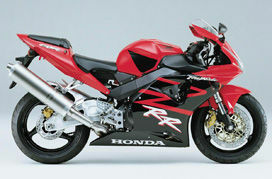 The last of the series to bear the name CBR900RR, the 2002 model featured higher displacement of 954cc and higher maximum output of 150.9 PS (European specification). While piston bore rose from 74 mm to 75 mm, greatly reduced piston and piston pin weight prevented the extra vibration and stress associated with an increase in displacement. Redesigning the crankshaft and crankcase helped reduce total engine mass and friction, resulting in greatly enhanced performance and responsiveness. Further advances in lightweight design produced a 2002 model that had a dry weight of just 168 kg—2 kg lighter than the 2000 model. While offering more power than ever, the 2002 model held true to the basic concept of the most lightweight super sport bike offering total control. 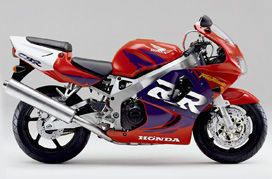 With its superior handling and easy-to-control body size, the 2002 CBR900RR earned acclaim for emulating the best aspects of the first-generation model with extra edge. The seventh-generation model featured the Unit Pro-Link rear suspension, a center-up exhaust system and other advanced technologies from the world of racing. Designed with participation in the Superbike World Championship and other racing events in mind, the lightweight, compact 998cc engine had several new features. The Programmed Dual Sequential Fuel Injection (PGM-DSFI) system featured two independent injectors per cylinder, the second of which would activate when the throttle was one-quarter open at 3,000 rpm or higher, resulting in enhanced output. The direct air induction system helped the engine offer excellent output characteristics and quick throttle response in the mid to high rpm ranges. Ready not only for the street but also the racing circuit, the CBR1000RR opened up a new world of possibilities for the CBR series of super sport bikes. While retaining the basic structure of the 2004 model year engine, the 2006 model year engine featured straight cylinder head intake ports and larger exhaust ports. Adjustments to the shape and timing of the valves raised the efficiency of combustion, intake and exhaust, resulting in a more advanced engine with stronger torque at low to midrange speeds. The diameter of the front brake disc was increased from 310 mm to 320 mm while its thickness was reduced from 5 mm to 4.5 mm, and the rear brake featured a new and more lightweight and compact caliper. These changes raised braking performance while reducing vehicle weight. 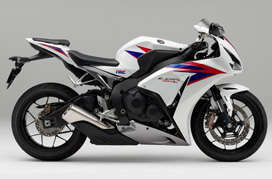 Under the concept All the Best in Super Sport, the ninth-generation CBR1000RR was designed to be No. 1 in rideability, design and power. The model featured a back torque limiter system adopted from the RC212V, as well as an assist slipper clutch that reduced clutch lever load. 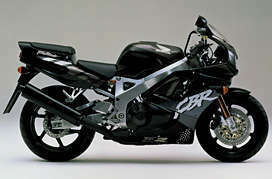 The traditional rideability of the CBR series was also enhanced. Lightweight wheels and monoblock brake caliper contributed to a design that was more lightweight and compact, while the new shorter muffler helped concentrate mass. The upper cowl featured reduced surface area in parts farther from the bike’s center of gravity, and the seat cowl was made more compact. With these and other features, the design of the model helped make vehicle mass as concentrated as possible. 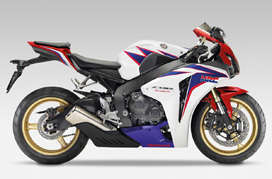 The CBR1000RR ABS featured the world’s first Electronically Controlled Combined ABS for a super sport bike. This Brake-by-Wire system converts hydraulic pressures generated by the rider’s brake lever and pedal input into electronic signals, which in turn communicate to a power unit how much braking force to apply. Since the computer offers precise control of front-rear braking force distribution and ABS operation, the system accommodates the vehicle characteristics that have been an issue in the implementation of ABS on super sport bikes: the lightweight body, short wheelbase and high center of gravity that cause a high degree of pitching during acceleration and deceleration. In addition, positioning the system in the center of the bike’s layout helped reduce unsprung weight and concentrate mass, thereby preserving the super sport bike’s exceptional dynamic performance. While based on the 2009 model, the eleventh-generation CBR100RR was refined in every area to offer riders even sportier riding enjoyment. To mitigate torque variations during cruising, the diameter of the ACG flywheel was increased, and the crankshaft flywheel attachment point was made more rigid, resulting in a 6.87 percent increase in the inertial mass of the crankshaft and related parts. The controllability of throttle operation was also enhanced. To prevent an increase in weight, the radiator fan motor was made more compact, the thickness of the exhaust pipe flange was reduced, and the engine head sealing bolt was changed to aluminum. Refinements such as these helped take the completeness of the model to the next level. 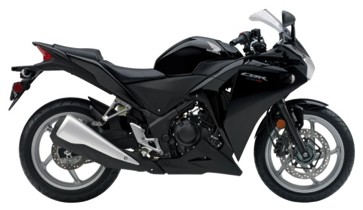 Marking the 20th anniversary of the CBR series, the 2012 CBR1000RR has been designed with a focus on the ease of handling that is indispensable to a super sport bike. In every aspect, the motorcycle has reached a new level of maturity. The front and rear suspensions, which have a significant impact on handling, have both been given completely new structures. The rear uses a Balance-Free Rear Cushion, in which a valve-less piston slides inside the cylinder, pushing out oil that passes through a separate specialized component to generate damping force. The front uses a Big Piston Front Fork with a larger pressure-receiving area for smoother generation of damping force. The engine features revised fuel injection settings for enhanced control when the throttle starts to open from fully closed, giving riders access to high power with even greater peace of mind. 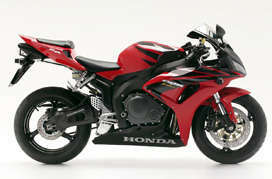 Pada 20 Oktober 2010, Honda Thailand merilis versi baru dari CBR150R. Dengan tampilan lebih gambot plus pengabut BBM PGM-FI (Fuel-injection). CBR150R PGM FI ini juga masuk ke Indonesia secara impor dari Thailand. Tahun 2011 diawali dengan diluncurkannya Honda CBR250R. Motor ini didukung inovasi teknologi yang menghasilkan kekuatan akselerasi, kelincahan, dan kemudahan dalam pengendalian. Pada generasi ini menggunakan sistem Honda PGM-FI (injeksi) yang menjadikannya lebih irit bahan bakar ramah lingkungan. Serta teknologinya disempurnakan dengan teknologi Combined Antilock Bracking System (Combined-ABS). Pada 14 Mei 2014, Honda memutuskan untuk melakukan major refreshment untuk motor CBR di kelas 250cc. 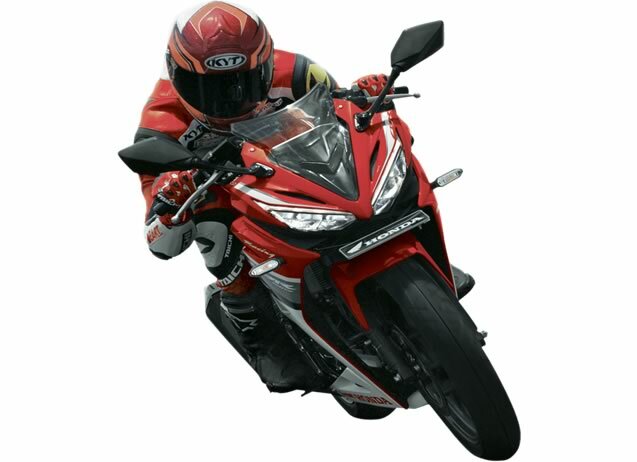 Motor All New CBR250R pun diluncurkan dengan desain baru yang lebih garang. Tidak hanya itu, sektor mesin pun dibenahi agar tenaga yang dimuntahkan bisa lebih nendang! Moto ini tampil semakin impresif dengan desain agresif yang dilengkapi lampu ganda dan desain bodi yang terinspirasi oleh Honda CBR1000R serta fitur-fitur mewah dan performa kelas teratas. All New Honda CBR150R hadir dengan evolusi performa dan desain agresif yang berorientasi pada kecepatan dengan garis aerodinamis tegas dan tajam yang diperkaya fitur racing yang sesungguhnya. Evolusi ini mampu menghadirkan sensasi balap berkat mesin baru yang bertenaga dengan banyak keunggulan dan inovasi chassissehingga memberikan keseimbangan optimal. Penyematan fitur baru dan posisi berkendara layaknya pebalap sejati ini menyuguhkan imajinasi balap pengendara. All New Honda CBR250RR hadir di tahun 2016, sebagai model pertama di dunia yang akan menorehkan standar premium sepeda motor di Indonesia. Dikembangkan berdasarkan filosofi dasar Honda dalam mendesain motor supersports yaitu mengaplikasikan kasta motor balap tertinggi. Tema desain “Speed Shape” menghadirkan tampilan menarik dan fungsional. 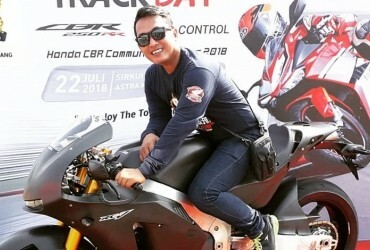 All New Honda CBR250RR merupakan model pertama di kelasnya yang mengaplikasikan throttle-by-wire, dibekali mesin generasi baru 250cc liquid-cooled 4 stroke DOHC 4 katup – 2 silinder dikembangkan melalui kolaborasi kuat antara tim engineer dari Jepang dan Indonesia.